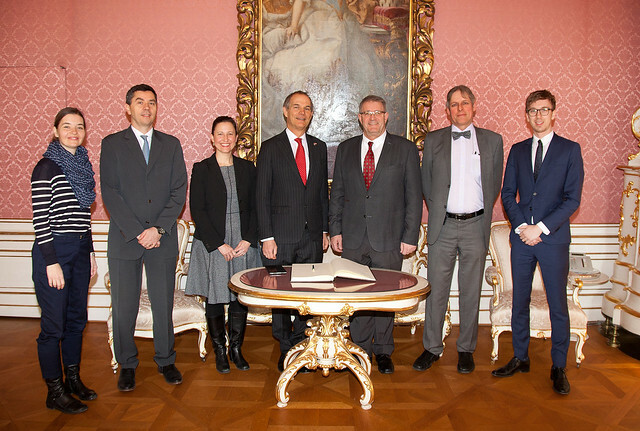 Leigh Turner, UK Ambassador to Austria and UK Permanent Representative to the United Nations and other International Organisations in Vienna visited IIASA on 28 February 2019. During his visit, Turner met with IIASA Director General and Chief Executive Officer, Albert van Jaarsveld, members of the Directorate Office and with the IIASA External Relations Department, to learn more about IIASA-UK research activities. He heard presentations from representatives of selected IIASA research programs, including the IIASA Water Program and the IIASA World Population Program. Additionally, the visit incorporated a meeting with the current IIASA-UK staff members to learn more about their work, their research and their time spent at IIASA. Leigh Turner CMG, Her Majesty’s Ambassador to the Republic of Austria and UK Permanent Representative to the United Nations in Vienna. His previous role was HM Consul General Istanbul and Director General for Trade and Investment Turkey, Central Asia and South Caucasus from 2012-2016. From 2008-2012, Leigh was HM Ambassador in Kyiv, Ukraine. 2006-2008 he was Director of Overseas Territories in London, responsible for territories including St Helena, the Falklands and Bermuda. Previous postings have included Berlin, Moscow and Vienna. UK national interests are integrally connected to complex global systems that impinge on the country, its economy, and its people. Systems analysis is one of the few research tools that has the breadth and depth to explore complex problems across multiple sectors, regions, and timeframes. Current collaborations between IIASA and the UK are enhancing UK expertise in developing and applying systems analysis especially integrated assessment models. Establishing multinational and multidisciplinary teams of researchers is a key building block in IIASA’s work and many productive partnerships exist between IIASA and UK researchers. Muttarak R (2018). Normalization of plus size and the danger of unseen overweight and obesity in England. Obesity 26 (7): 1125-1129. DOI:10.1002/oby.22204. Hanger-Kopp S, Bayer J, Surminski S, Nenciu C, Lorant A, Ionescu R, & Patt A (2017). Insurance, public assistance and household flood risk reduction: A comparative study of Austria, England and Romania. Risk Analysis DOI:10.1111/risa.12881.